Pickle Tray, Cheese tray, Fruit tray and a basket of fresh bread. One main entrée or two smorgasbord items, one vegetable dish. Tossed green salad or Caesar salad and three additional salads. Tables of assorted sweet treats such as Nanaimo bars, tarts etc. An additional main entrée is $3.00 per person. An additional smorgasbord item is $3.00 per person. Please see our menu for other meal options. We require Three weeks’ notice for allergies or Vegetarian meals requested. 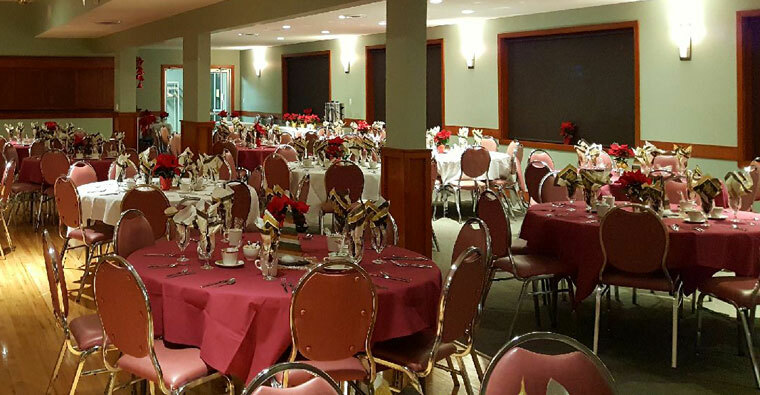 The catering group will set the tables with cloths, nice quality paper napkins, silverware, salt and pepper and wine glasses for $2.50 per place setting. Setting your own tables cost $7.00 per cloth and $1.00 per wineglass with quality white paper napkins. Please inform us if there are any items you do not wish to be included on the tables.